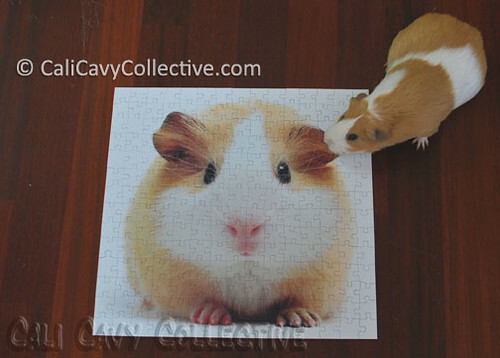 While roaming the stacks of a local bookstore our humans stumbled upon a jigsaw puzzle featuring the well known visage of Guinea Pig Over White. Being fairly predictable guinea pig lovers, they brought it home and spent a quiet hour or two putting it together. 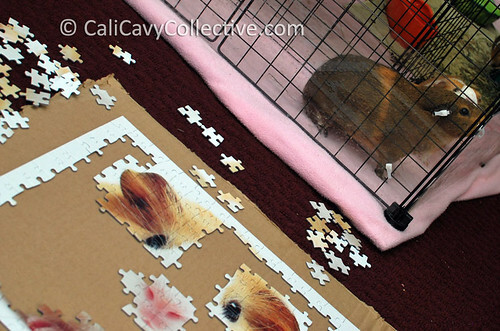 As the puzzle took shape, Belka and Peaches supervised nearby to make sure our humans didn't peek at the box. By now they should know what a guinea pig looks like without needing a guide for reference. All too soon the puzzle was completed. Peaches checked to make sure it was put together correctly. Ever since spotting this coin purse Peaches has been convinced that she resembles this famous piggy. Hmm.. not quite Peaches, but close. 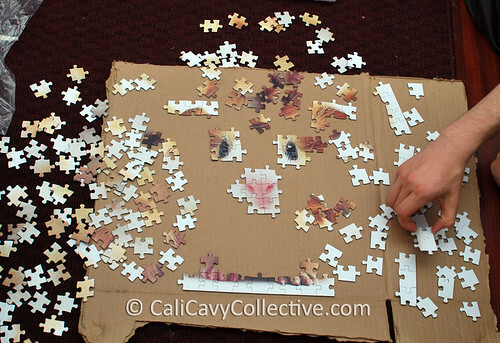 Drat, I only have the puzzle, a wall poster and two coin purses. Now I need to search out the rest of the collection.